How could I not like this? It’s like hating a puppy. It sounds so great: American techies, Egyptian freedom fighters, a Nobel laureate, human rights. But upon closer inspection I began to realize what about the project bothered me. First off: ego. No, not the ego of the creators. In my interactions with them, the folks at Cloud to Street have been reflective, thoughtful, and patient in fielding my many critical emails. Yet the site still screams “look at me!” The problem is, it’s the wrong “me.” Though ElBaradei did write a message on the About page, I could not find his name once on the homepage. You know whose name and logo appear everywhere, though? IdeaScale. Yes, they were partnering with a Nobel laureate and they decided that the most important name to plaster across the site was their own. Below is a screenshot of the homepage from the most egregious angle, with 5 mentions of IdeaScale, either in text or logo form. Yes, the people at IdeaScale were very kind to donate their software and man-hours to help the Egyptian people… and they want you to know it. It’s not evil or anything, it’s just tacky. You shouldn’t get egotistical about someone else’s revolution. If you want to help, then do so without ego, do it with humility. Their revolution is not your branding opportunity. The site draws readers directly to draft human rights principles drafted by some o[sic] the most prominent Egyptian experts on the subject. But it allows them to click on any principle and either vote on it or leave their own comment. Over time, as the community of users builds, each principle will feature a string of conversations for and against, with votes driving principles up or down. What’s wrong with this? Nothing horrible, it’s innocent enough. But there’s also not much right with it if you are interested in engaging the Egyptian people in a meaningful discussion of the human rights that should be in their constitution. First of all, most of the “Egyptian people” are not online. The most recent figures I have indicate that about 1 in 3 Egyptians is an Internet user. Meaning that most aren’t – by a long shot. If I was asked to design a project to engage the Egyptian people in this human rights discussion, I would have it be offline, maybe meetup style with the help of SMS, with local NGO leaders moderating the conversations to strengthen the connections between citizens and local civil society actors. Yes, there is a role for technology, but it would need to be context-appropriate. Here’s another way to think about it. The penetration rate of smart phones among US adults is about the same as the Internet penetration rate in Egypt – 33%. Now let’s imagine that when President Obama set up his questions tool (more on that later) during his transition in 2008 he made it accessible only as a smartphone app. There would have been an uproar. They’d say he was catering to elites, ignoring the average citizen, dangerously out-of-touch. Yet somehow this scenario is good enough for Egypt? It’s techno-fetishism over context. It’s willfully ignorant. And it’s a little insulting. Let’s go back to the time that we tried a similar tool in the US. It was called Open for Questions (image left), and it was a tool launched during the presidential transition in 2008 to let citizens submit and vote upon questions for the incoming President. It was meant to be a super-democratic, super-transparent way for citizens to have some say in the President’s agenda. Unfortunately it was one of Obama’s few technology debacles. 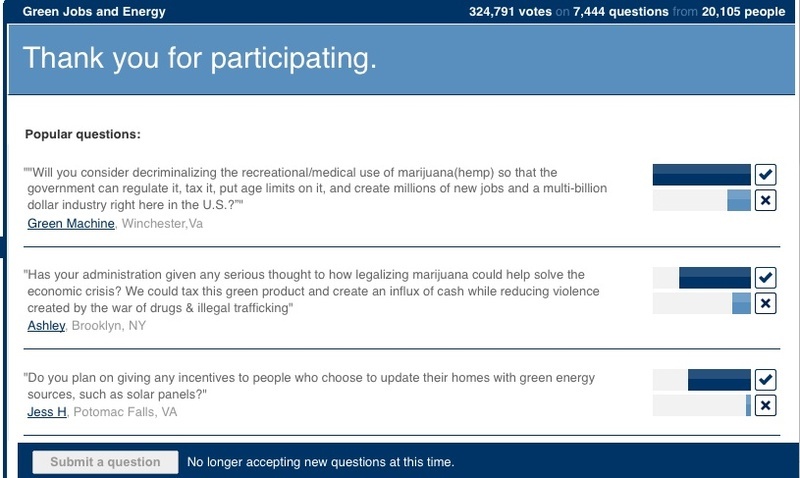 Marijuana legalization activists got wind of the site and gamed it, voting up their own questions. Though Obama did answer one of their questions at the subsequent townhall event, the general feeling was that the experiment was an easily-gamed failure. Yet it wasn’t really a software problem that could be programmed aware. You just don’t make public policy through a web site. It’s chaotic. It’s game-able. It’s unrepresentative. It over-simplifies. This format didn’t work as a way of selecting questions for a simple townhall meeting. How could it be appropriate to develop ideas for a national constitution? What is the value proposition of Wathiqah.com? Will ElBaredei use the results of the input in his campaign platform? Will the authors of the Constitution refer to it? I couldn’t find any evidence of this. And that’s where the “meaningful” of meaningful discussion of constitutionally-protected human rights comes in. If there’s no clear value proposition, there’s no meaning. It’s just a nice discussion. And the Egyptian people deserve better than that. What might the responses to this critique be? “We were under time pressure.” “We did the best we could with scarce resources.” “It’s better than nothing.” Actually, I hope that those would not be the arguments, because they are arrogant and insulting. When you’re talking about the history of a country, about democracy and freedom – especially if it’s someone else’s democracy and freedom – then “good enough” and “better than nothing” are fairly week defenses. Any help should not be “good enough”, it should be the absolute best that each person is capable of, done with the utmost humility and care. The Egyptian people have proven time and again that they are leading digital activism innovation, that they are heroic stewards of their own revolution and their own freedom. We in the West need to learn that there is not always a role for us and if our help is needed we must act with humility and in subordinate roles. It doesn’t matter if technology efforts like Wathiqah make us in the West feel good or helpful or part of a moment in history. When the creation of these projects draws attention and potential resources away from home-grown efforts, when it causes fragmentation, we need to have the humility to step back. Because, in the end, it’s not about us. On behalf of Cloud to Street, let me say that I welcome any comments on our efforts to lend a hand to Egypt’s democratic activists, whether their comments are positive or negative. What I find unfortunate about Mary Joyce’s blog post is that she did not bother to contact the Egyptians responsible for the http://www.wathiqah.com website before criticizing it, thus depriving them of a chance to explain their decisions in proposing, designing and operating this website. If she had, she might have learned that in fact, that this is an Egyptian initiative, with all content and all design decisions made by Egyptians. She would also have learned that the online campaign is accompanied by offline outreach efforts throughout Egypt, and that Ideascale was not involved at all in the design of the website. To be clear, Cloud to Street’s role was merely to provide technical advice and support to an Egyptian organization at their request. In attacking decisions that were made by the office of Dr. El Baradei she risks being that which she claims to abhor: an American telling Egyptians how to run their politics. 1. The site seems more intent on promoting IdeaScale’s brand than an Egyptian brand: If IdeaScale was not involved in the design then the overwhelming placement of their logo is all the more mystifying and even misleading. 2. You don’t write a constitution online: If your Egyptian partners are indeed doing offline outreach, which is great, there is no clear connection between that and the site. If I made the mistake of assuming that there wasn’t any offline component, then others will make the same mistake. Not every user can be expected to contact the project directly. More transparency about offline activities would also give the project greater credibility. 3. Wathiqah lacks a value proposition: The presence of offline outreach does not address the problem that there is no clear connection between site input and constitution-writing. I still think this is a valid question for anyone online policy-making project. 4. Westerners need to act in a subordinate role: If this is “an Egyptian initiative, with all content and all design decisions made by Egyptians” that is awesome. However, if this is so, then why is that organization anonymous (you don’t mention it by name in your comment)? If you are so vague about the Egyptian creators of the site – “an Egyptian initiative,” “Egyptians,” “an Egyptian organization,” – then the project will be associated with those who are named: Cloud to Street and IdeaScale. Again, more transparency about who is actually behind the project (an ElBaradei NGO?) would also give the project greater credibility. And that final zinger, that I am “an American telling Egyptians how to run their politics,” that’s a low blow and inaccurate. I’m certainly not telling anyone to do anything and I think Egyptians are completely capable of dealing with the criticisms in this post, despite your chivalric defense of them. They can accept my critiques or tell me to f- off or ignore me, but there is nothing dictatorial in what I’ve written. Mary, I’ve now sent you the contact details for the person at the Baradei campaign who conceptualized and led the development of http://www.wathiqah.com. I don’t feel comfortable providing their answers to your criticisms, but they should be able to. Note: Below is the response from the platform’s designer, Nadine Wahab, which she gave my permission to publish here. She asks me in the email to post a retraction. While I stand by my statements on branding practices and value propositions for these kinds of platforms, I do retract my accusation that Wathiqah is American-led. It was, in fact, designed by Ms. Wahab and Cloud to Street played a supporting role. Also, while Ms. Wahab is the Deputy Campaign Manager of Dr. ElBaradei’s presidential campaign, Wathiqah is not an official campaign activity. It is offered by Dr. Elbaradei for public discussion. I read your post. I am a little irritated that you didn’t take the time to check before you posted. But that being said, my irritation at your post is over shadowed by the irritation of dealing with Ideascale. And even that is greatly over shadowed by my irritation, frustration, and anger of having to deal with a deaf, mute and blind SCAF. While i don’t have the time to write up a full responce, I wanted to let you know that it was a pleasure working with Clowd to Street. Ben and his team are amazing. They are very responsive to our needs on the ground, and very careful not to impose an American prospective on the project. They gave me the resources of Silicon Valley without the Ego. I would team up with them again anytime. Thank you for trying to hold US activist accountable and highlighting American exceptionalism. I have been battling the same thing for a while. But your post was a complete miss. I hope that you would post a retraction. Pingback: Can crowd-sourced discussions be democratic?